As I continue prototyping the research questions around the Landscape of Trust, I’m sharing the results and #WorkingOutLoud. There are two main outcomes from this work: the first is to map the landscape of trust, to understand the different terms that populate this space and to try to reconcile which are related and how. The second is to consider the taxonomy of trust: at the moment I’m thinking about four levels, from absence of trust through to functional trust, which is the bare minimum we need to operate, then into invested trust, which is the thing we need in the Socially Dynamic organisation, and onto blind trust, unquestioning and possibly dangerous. Today it’s that top tier that I’m exploring further. 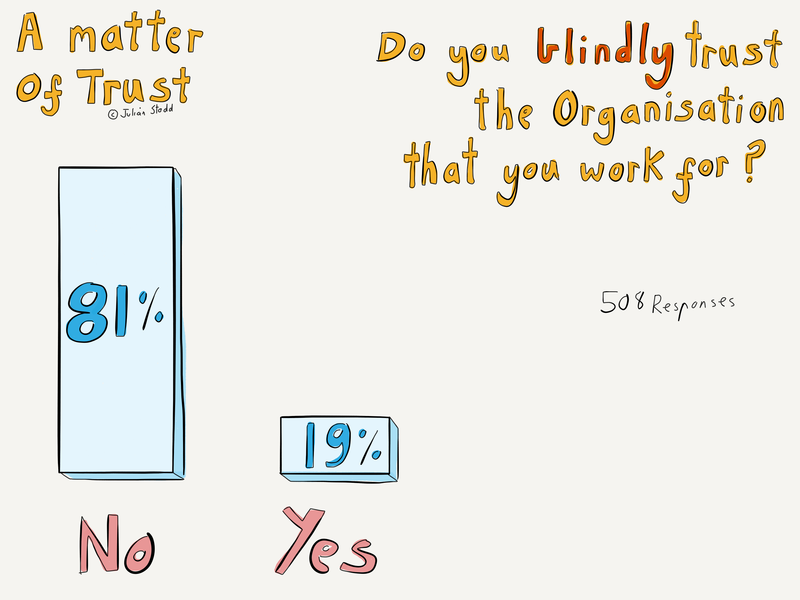 I asked the question, “Do you blindly trust the organisation that you work for?”. Out of 508 responses, 19% said yes and 81% said no. This is a higher figure than I had anticipated, but some of the context around responses indicates that this may be down to the way trust is dealt with in different sectors: for example, anecdotally, it appears that there were many explicit conversations about trust within a military context, but almost no conversations within a manufacturing one. I would be pleased to surface this, as part of the hypothesis is that the landscape of trust will vary between different cultures and different sectors. Blind trust is that which is invested without question, and possibly without responding to incoming data: once it is lodged it is there to stay and hard to displace. My premise is that this type of trust may not be healthy, that it is in spaces with blind trust that we are more likely to see ethical failures and cultural fragmentation. Clearly there is a lot more work to do to explore this further, but I think it is a fair hypothesis that we can trust too much in an organisational context. There may be some correlation between blind trust and faith in rigid hierarchy: it’s possible, although I’m speculating, but overly rigid and controlling hierarchies may inspire blind trust, or to post another way may quash invested trust and demand functional trust. All this comes down to the fact that trust is a variable measure, variable both in quantity and quality. Both this question and the last, which looked at whether people had ever had an explicit conversation about trust with their employer, had very strong responses, which is as I would expect. 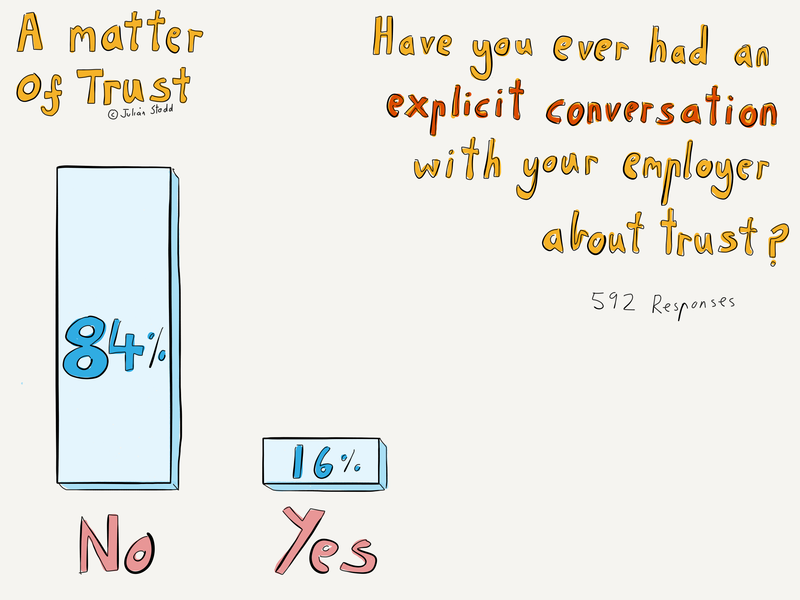 Only 16% of respondents had had an explicit conversation about trust, and I suppose I should investigate whether these 16% correlate to the ones who exhibit blind trust, but that’s an area to explore in the future. I have started to gather some narrative accounts of trust, asking people for a hundred words which describes what trust means to them. If you’d like to take part in this exercise, do get in touch. I will continue to #WorkOutLoud as I refine and develop this work. This entry was posted in Trust and tagged Blind Trust, Blindly Trust, Culture, Ethics, HR, Leadership, Military, research, Social Age, Trust. Bookmark the permalink. Love your developing thinking around trust which is both important and neglected (accept in a hand waving kind of way). In healthcare patients come to trust – or not – out of a deep need. Faced with the implicit fear of death there is a strong bias to being trustful and of seeing the person you trust as powerful. So health is an interesting edge case for thinking about trust as it is a universal but asymmetric example of trust – after all when I was a GP there was no need for me to ‘trust’ my patients in any reciprocal way at all. A useful way to think about this is to use Transactional Analysis’s Parent-Adult-Child structure: when you’re waiting to have you’re colectomy you are frightened and rightly want a strong parental figure to trust. Recovered you want a more adult-adult relationship. Less obviously clinicians have their own deep, inner needs for taking the parental role – after all removing someone’s colon, say, or listening to their suicidal thoughts raises deep questions about ones own capability and mortality. So clinicians and health systems tend to be addicted to parent-child versions of trust and -whatever the rhetoric – less comfortable with adult-adult versions. Sherry Turkle said “Technology proposes the architecture of our intimacies” – and the autonomous, equal technology that underlies the web continually proposes adult-adult relationships – just trying being parental and a forum! Perhaps this is part of the reason why healthcare – and many other hierachicsl organisations – has so much difficulty with social media and the social age.